The Bureau of Land Management’s disposal of developable land plays a big part in Southern Nevada’s economy. So a recent release on future plans on the amount of land that could become available has left some in the valley concerned. The proposal’s preferred alternative would reduce the total of disposable acres from 168,903 acres to 155,279 acres, or 8 percent. Mike Shohet, the 2016 president of the Southern Nevada chapter of NAIOP, Commercial Real Estate Development Association, said the amount of land the BLM’s latest Draft Resource Management Plan (RMP)/Environmental Impact Statement (EIS) makes available would not be sufficient for the projected level of growth in the local economy’s transportation systems, jobs and other areas. 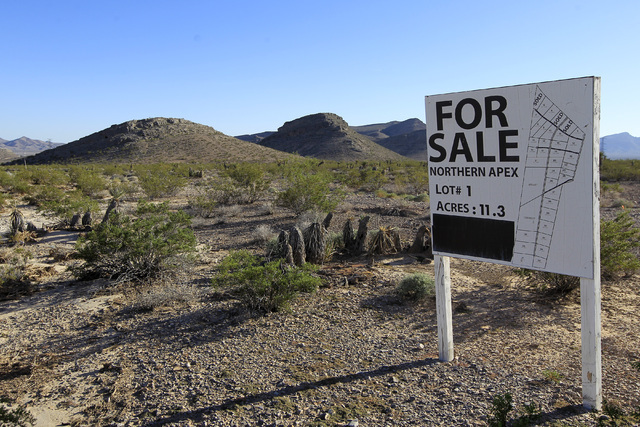 A recent report by the Theodore Roosevelt Institute, commissioned in February by NAIOP Southern Nevada, suggests that the number of land parcels available under the newest Resource Management Plan by the BLM, if implemented, would leave a deficit of thousands of acres of needed land. A public comment period on the BLM draft opened in 2014. Several final scenarios were proposed by the BLM, which included land disposals. Under the current scope, more than 32,000 acres are made up of parcels of 70 acres or more. But of those, the report contends, only about 9,000 acres are located in “employment opportunity areas.” In total 13 sites in the employment zones that are larger than 70 acres. The Rosevelt Institute report notes that of the 6,800 acres of developable land in the Apex Industrial Park area in North Las Vegas, only 2,300 are actually owned by Apex Holdings. In total, only about 4,700 acres of developable parcels will be available in the next three to five years. This includes the 2,300 acres at Apex and the remaining 70-plus acre parcels. Outside of Apex, there are two other sites with large parcels in the employment zones: Speedway/Northeast Industrial area, where more than 900 acres are available for future growth in North Las Vegas; and 359 acres near the Henderson Executive Airport. According to the Governor’s Office of Economic Development, 10,000 to 12,000 acres will be needed in the targeted employment zones through 2034 in order to adequately support the valley’s growth. These estimates are based on projected growth in IT, health care and industrial manufacturing, which has been on a growth spurt over the past few years, along with other sectors. According to Alan Schlottmann, the lead on the Roosevelt Institute’s study, there is a “limited availability of large parcels in Southern Nevada for long-run development of Nevada’s targeted industries, such as high-tech manufacturing,” which could represent a serious constraint, he said in a written statement. The limited amount of land available projected to be available from the BLM, might raise the cost of doing business by 3 percent to 5 percent compared to a previously established baseline. If the 3 percent scenario were to take place, an adjustment in population expectations would have to be reduced by 7.2 percent by 2035. Similarly, employment numbers could be reduced by 8.2 percent and the GRP by 9 percent. In the case of a 5 percent scenario, equivalent reductions would reach 11.5 percent in employment, 13.2 percent in employment and 14.3 percent in GRP. The BLM is on a temporary hold to allow the Southern Nevada district office time to look over the public and cooperating agency comments brought forth during the draft RMP and EIS. Shohet is most concerned about the blockage in the southern portion of the valley, especially for potential sites for industrial users. These arguments included the potential future site of the Ivanpah Airport, where 6,000 acres are pegged for the project, which will be on the east side of Interstate 15 between Jean and Primm. While the airport plan is good, Shohet sees issues with the BLM’s current plan to remove 25,000 acres on the west side of the 15 and declare it an area of environmental concern, he said. This reduction in disposal plans, according to Shohet, would create transport issues in the region, as the opening of a multimodal facility, such as an airport with cargo, needs to be supported by surrounding infrastructure, he said. Even though the last update to the BLM’s RMP/EIS was in 1998, Kirsten Cannon, public affairs specialist at the BLM’s Southern Nevada District Office, said that RMPs can be updated at any time if the need for a reassessment comes to light. Cannon gave two examples. One was population change, which has changed quite a bit since the late 1990s. The second, the implementation of renewable energies that were once not allowed on public lands, but are now spread across many regions. Cannon also noted that there are still more than 31,000 acres available for disposal under the Southern Nevada Public Lands Management Act. And Congressionally designated land disposal areas equate to more than 64,000 acres. More than 81 percent of land in Nevada is owned by the federal government.